Money saving online coupons for 2019! Enter the 10OFF coupon code when you check out for $10.00 off your full membership fee. These coupons automatically activate on January 1, 2019 and automatically shut off on March 1, 2019 so be sure you take advantage and save some money! In addition: For those who join MPAG after 7/31 you can use the 50OFF coupon code when you check out to get 50% off of the current years membership dues. NOTE, this coupon is not active prior to July 31st. 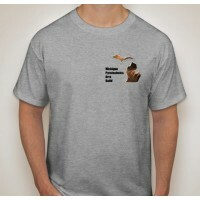 1 year individual full MPAG membership.Your membership application is subject to MPAG Board review.&..
100% cotton Gray T-Shirt with MPAG spelled out on front & back + the explosives DOT logo below o..
Due to the transaction fee(s) that we are charged by PayPal, products purchased via the MPAG store may be slightly higher in price to cover the costs. Thank you for your understanding.